When it comes to unlocking your smartphone, for a long time the PIN or passcode was the only option for security. With advances such as biometric-based security in Apple's Touch ID and later Face ID, the ways to unlock smartphones have been expanding. Android users have also received new methods for securing their phones and unlocking them with more convenience, including the ability to unlock your phone via Bluetooth using your personal Fitbit. Android users got quick unlock features when Smart Lock capabilities were introduced in Android Lollipop 5.0 OS. Smart Lock added several new locking and unlocking methods, and it also improved on the previous facial recognition feature offered in earlier versions of the OS. The Android 5.0 Smart Lock feature has the ability to use a trusted Bluetooth device's presence to unlock your phone. Here's how to set up Android Smart Lock to use a Fitbit (or any trusted Bluetooth device) to unlock your phone. These directions should apply no matter who made your Android phone: Samsung, Google, Huawei, Xiaomi, or others. Ensure that you have a passcode or pattern set for your device. If you need to set one for the first time, open your Android device's Settings menu, navigate to Personal and choose Security. In the Screen Security section, choose Screen Lock. If there is an existing PIN or passcode, you'll have to enter it here, otherwise follow the instructions to create a new pattern, password, or PIN to secure your device. Enable Smart Lock. In order to use the Smart Lock feature with a trusted Bluetooth device, you'll first need to make sure that Smart Lock is enabled. Open your Android device's Settings menu. In the section labeled Personal, select Security. Navigate to the Advanced menu and choose Trust agents and make sure that the Smart Lock option is turned to the On position. In the Screen Security section, choose Smart Lock. Enter the screen lock PIN, password, or pattern that you created in Step 1 above. 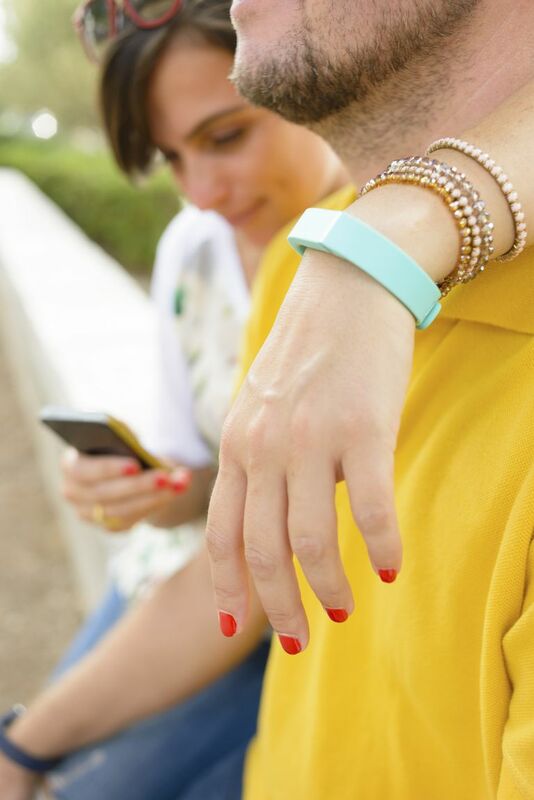 Set Smart Lock to recognize your Fitbit as a trusted Bluetooth device. To set Smart Lock to trust a Bluetooth device for the purpose of unlocking your device, first make sure Bluetooth on your Android device is turned on. From the Smart Lock menu, choose Trusted devices. Select Add trusted device, then choose Bluetooth. Select your Fitbit, or another Bluetooth device you want to use, from the list of connected Bluetooth devices. The Bluetooth device you want to use must have already been paired to your Android device for it to be available as a Smart Lock-trusted Bluetooth device. Choose the device from the list of Trusted Devices in the Smart Lock menu. Select Remove the device from your list, and then tap OK.
Be aware that, depending on the range of your phone's Bluetooth radio, someone nearby could access your phone if the device you've paired it to for Smart Unlock is nearby. Allowing your smartphone to be unlocked with a Bluetooth device can increase the risk for unauthorized access. For example, if you're in a meeting in the room next door to your office and your phone is left unattended on your desk, someone could access it without a passcode because your paired device — your Fitbit, watch, or other paired Smart Lock-trusted device — is within range for it to unlock the phone.